Nopalitos (cactus) We know we are strange, we eat "strange", and our kinfolks are right along side us. LOL. This recipe came from my brother-in-law, Weaver. One year we had Thanksgiving at his home, and everything was Spanish oriented. We feasted on enchiladas, his famous Shrimp dish that I call the "Shrimp-Watchamcallit" and another dish I really enjoy, Nopalitos, or cactus. I know what you are thinking….good grief, those people eat cactus ! and yes, we do, and it is very delicious, thank you. Now you can fix your own cactus pads, which is difficult to me and stickery, or just buy a jar, which I do, already cleaned and ready to go. Nopalitos 1 jar (14.7 oz) Nopalitos ( tender cactus) Drain and rinse. I usually cut these in smaller pieces, looks pretty in the dish, instead of leaving them in strips. ADD: Fresh tomatoes, diced…..you can use one or many Onion, diced….I usually use several onion rings, sweet onions, and dice them cilantro…fresh,chopped fine, use small amount to start, to taste Salt….to taste Squeeze fresh lime juice over this and serve ice cold. Nopalitos come from the Prickly Pear Cactus. The edges are cut off, the pads are scraped of stickers, they are rinsed and diced or cut into strips. The larger pads have "eyes" after scraping but these are cut out with a knife or dug out with the end of your potato peeler.The flavor of nopalitos is similar to that of a green bean. Nopalitos are very rich in vitamins, so they are good for you !! Lots of Vitamin A,C, and K. You have to be careful and not overcook them, or they will be slimey. I love just the young pads, they have very few stickers on them. They can also be used in omlettes. Cactus really has other uses. The fruit of the Prickly Pear can be used for jelly or syrup. The pods are peeled, the fruits cut in half and cooked, then drained through cheesecloth and made into a delicious jelly. Mom used to make cactus syrup which we used on pancakes. There are lots of good "greens" out there, good for the picking, such as dandelion,poke, lambs quarter. Yes, you can eat weeds for free. LOL.You can even eat young tumbleweeds and careless weeds. 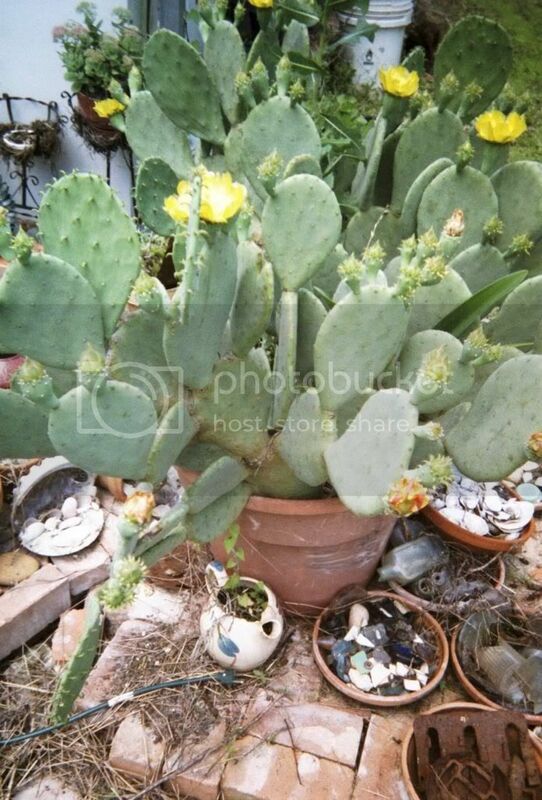 I saved one huge cactus plant from the old homestead.It blooms every year, lovely yellow flowers, and has lots of good pads on it.We also saved the cactus from the land that belonged to Benny’s Great Aunt Leona. She loved cactus and had a bed of them. I could not leave them there when the land was sold, I had Benny dig them up and bring them home. They are family. They are around the chimnea. They bloom every year, beautiful purple blossoms. I know she has to smile from somewhere when she sees her cactus still blooming, continuing as her love of family for all those years. We auctioned off some of the plants at the family reunion, so now they continue to be shared by those that go on after her.